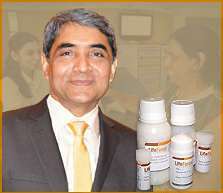 Dr Shah's treatment for Hepatitis C consists of the Patent product (international patent) in addition to some of the commonly used effective homeopathic medicines. Some of them are listed as under. Every case calls for a detailed study of the patient individually. There is no disease-specific medicines in homeopathy. The exact treatment is determined only by "in-depth" evaluation of the individual case. The medicines described below are commonly indicated in Hepatitis C, only for the purpose of information. The readers are advised not to indulge in any kind of self-medication. This is a drug that is prepared from the flowers of the plant commonly known as Celandine. It is one of the most commonly used drugs in homeopathy for hepatic affections. This remedy acts very specifically on the hepato-biliary system. It's frequently used in cases of Hepatitis C as well as other kinds of hepatitis. It acts favorably on the liver and restores the deviated functioning back to normalcy. Jaundice with pain and heaviness of the abdomen are common features of this remedy. Much lethargy and weakness in general with no desire to eat at all. Intense nausea and vomiting are also effectively tackled with this drug. In all, this is a very good remedy for hepatic and biliary affections in general. This is another wonderful drug in homeopathy which is prepared from the roots of a plant commonly known as wild hops. After undergoing the process of potentization, the inner hidden curative powers of this drug are brought to the surface. Bryonia is a drug which positively influences multiple systems of the body such as the gastrointestinal system, hepato-biliary system, musculoskeletal system, respiratory organs, etc. Its one of the frequently used drugs for Hepatitis C, dyspepsia, migraine, bronchitis, frequent respiratory infections, joint pains, backache, menstrual complaints, etc. In hepatitis, this patient experiences soreness and burning in the abdomen. The abdomen is very tender to touch and patient also has intense nausea and vomiting. The complaints of the Bryonia patient are worse during the summer months and worse from heat. Potassium carbonate undergoes the process of potentization to evolve into a powerful deep acting homeopathic remedy called Kali Carb. Kali carb is a polychrest drug i.e. having effects on multiple organs and systems in the body. It has a broad sphere of action and is useful for a wide range of diseases. Kali Carbonicum positively influences liver, lungs, digestive system, heart, kidney, female reproductive system, skin, etc. Kali Carbonicum does wonders in cases of asthma, bronchitis, tuberculosis, pneumonia, hydrothorax, etc. It is one of the commonly used medicines for Hepatitis C, vitiligo, warts, eczema, urticaria, hair loss, trigeminal neuralgia, sciatica and low backache, hypothyroidism, heavy menstrual bleeding, etc. It is also useful for complaints of digestive system like acidity, piles, jaundice, gastritis, etc. This is a wonderful remedy prepared by the potentization of inorganic phosphorus. After undergoing the process of potentization, the latent healing powers of this drug are brought to the surface and it proves to be a wonderful remedy capable of curing a wide range of diseases. Phosphorus predominantly acts on the gastrointestinal tract, hepatobiliary system, blood, kidneys, bones, lungs, nervous tissue, etc. It is frequently used in the homeopathic treatment of Hepatitis C, nephrotic syndrome, cirrhosis, hemorrhagic tendencies, respiratory infections, osteomyelitis, paralytic symptoms, etc. Highly sensitive to external impressions such as light, sound, odors, touch, thunderstorms, etc. Restless, excitable, nervous individuals. Affects the kidneys also causing albuminuria and haematuria; patient has profuse, pale, watery urine with intense weakness. There is increased susceptibility to colds amongst children. It is one of the commonly used homeopathic drugs which has got profound action on every organ and tissue of the body. It is prepared from arsenic trioxide which undergoes the process of potentization to bring its latent curative powers to the surface. It is a wonderful remedy and has a very wide sphere of action. It predominantly acts on the gastrointestinal tract, respiratory system, urinary system, skin, reproductive system, nervous system, etc. It has good scope in the treatment of septic infections and low vitality. Arsenic alb. is frequently prescribed for conditions like Hepatitis C, asthmatic bronchitis, sinusitis, fevers, psoriasis, eczema, gastritis, enteritis, food poisoning, etc. It's a good drug for hepatitis wherein the patient has enlargement of the liver and soreness in the abdomen due to the same. Intense nausea and vomiting are other important symptoms during this state. Arsenic is also a good drug for breathlessness that comes on after taking cold drinks and cold food. Most of the complaints in such patients are associated with intense weakness and debility, restlessness and lot of anxiety. This is a homeopathic remedy that is prepared from the bark of the plant China officinalis. It is frequently used for the treatment of intermittent fevers, hemorrhages, Headache, gastrointestinal affections, gallstones, dyspepsia, dropsical conditions etc. Profound debility with all complaints. Hemorrhages with much debility, trembling, ringing, and buzzing in the ears. Fullness and flatulence felt in the whole abdomen; the abdomen is enormously distended. The patient is not relieved from eructation or may be only temporary better with this. Everything eaten turns into gas. Complaints are associated with nausea or vomiting of bile and mucus. Dropsical conditions. This homeopathic remedy is prepared from the plant commonly known as St. Mary's Thistle. It is an excellent remedy for affections of the liver, for cirrhosis, gallstone disease, enlarged liver, etc. This is a good drug for complaints occurring after abuse of alcoholic beverages, especially beer. The patient gets nausea, retching, vomiting of green, acid fluid. The liver is engorged, especially left lobe, swelled laterally in the transverse direction and is painful to pressure. Pain in liver most marked when lying on left side. The right hypochondriac region is very tender, even when the liver is not congested or enlarged. The pain is worse from motion and deep inspiration. Patient has an aversion to salt, meat. Commonly, the patient suffers from constipation and the stools are hard, difficult, knotty. Constipation alternates with diarrhea. A good remedy for Jaundice.